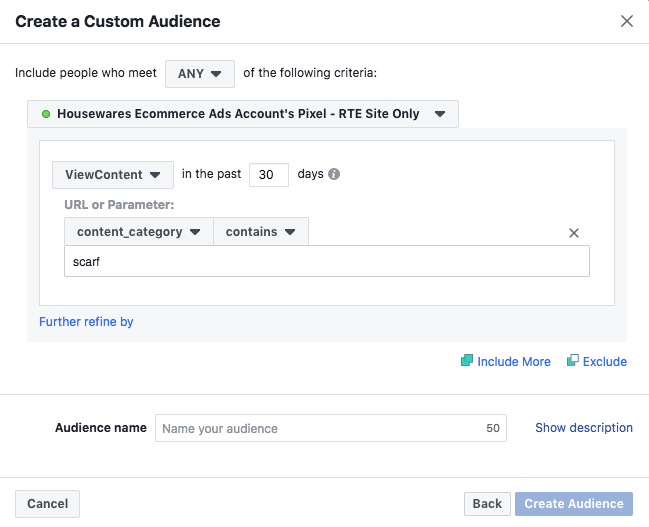 Reaching right target audience on Facebook that will be most likely to buy from your ecommerce store gets a whole lot easier if you leverage lookalike audiences. It lets you reach people who are like your ideal customers and have a high probability of buying instead of merely engaging with your ad. Lookalike audiences work based on the source audience that you use to create a similar audience. It all comes down to how you choose your source audience. This is where most Facebook marketers go wrong. The thing is: Lookalike audiences is available to everyone, the way how you use it to generate sales makes all the difference. Use a wrong source audience and you’ll continue to struggle with Facebook ads and targeting. A right lookalike audience is what you need to generate ecommerce sales. 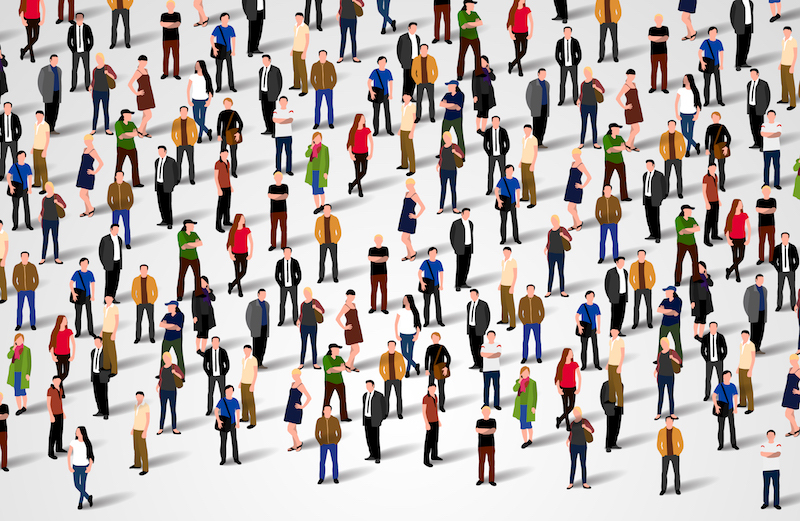 The following 6 lookalike audiences sources are must for boosting sales. What’s better than creating purchase lookalike audiences? You can use people who have purchased from your ecommerce store as a source for your lookalike audience to create a custom audience with similar characteristics. 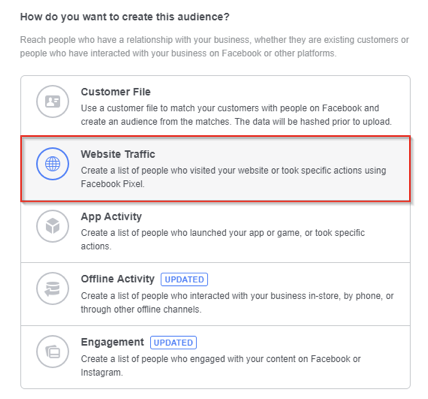 Note: You should have an appropriate Facebook pixel on your ecommerce store to create lookalike audience from website traffic. You first have to create a custom audience so you can use it as Source to create a lookalike audience. Here is how to do it. Click here to visit Audiences. Click Create Audience and select Lookalike Audience. 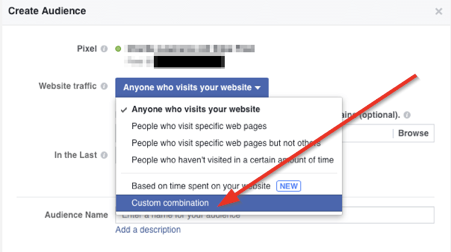 Click Website Traffic from custom audience creation tab. Choose the correct Pixel (in case your account has more than one pixel assigned to it) and select Custom combination from Website traffic dropdown. 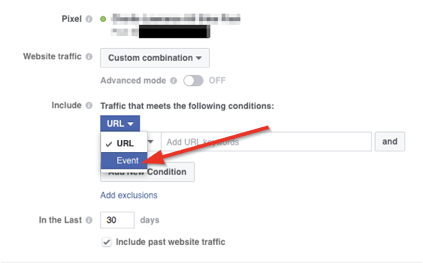 Select Event under the URL dropdown menu. 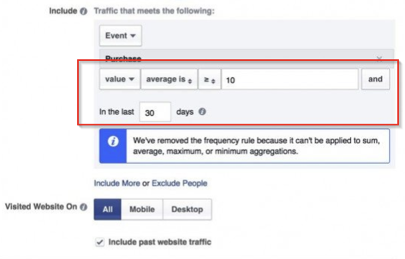 Now you an build audiences based on several events triggered by your visitors. In theory, the closer the event is to Purchase, the higher the quality of your Custom Audience and of your Lookalike Audience (LAA). That isn’t always the case. You should test audiences based on all events; sometimes a LAA based on the View Content event might outperform a Purchase LAA. Let’s start the Purchase event (assuming that you have enough hits on this event). Now, you have a several options. You can build an audience of all people who made a purchase within a number of days (up to 180) or you can create an audience based on the value of their purchase. Click on the Aggregate value option. Enter an appropriate value for the purchase event and select duration for people to stay in the audience in ‘In the Last’. Events can be used with parameters. Parameters help you create a highly targeted audience based on the pages visited, the content read, and more. With a little bit of creativity, you can create audiences based on people who purchased a certain product, several products from a collection, products whose name contain a certain word, or a certain product type. Give a name to your audience and save it. This custom audience can be used to create a lookalike audience by selecting it as the Source. 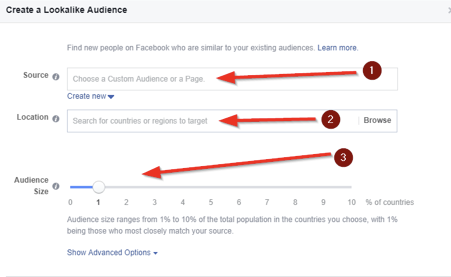 You can choose audience size that ranges from 1% to 10% of the total population in the target countries. The best way is to choose 1% as it will target those who most closely match your source. 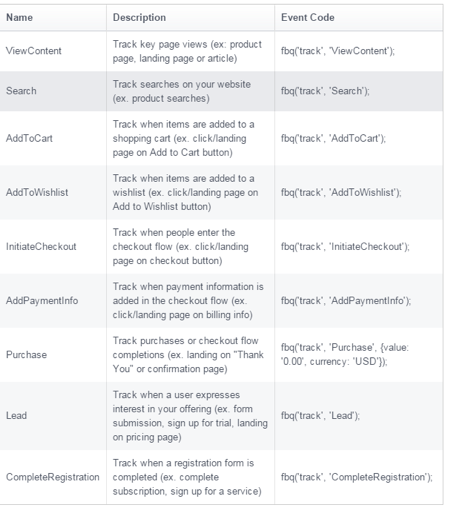 There are different types of events that can be used to track conversions on your website. You can use all of them to create a custom audience to create lookalike audiences. There are 9 events. AddtoCart (ATC) is another event that you can use to create a custom audience. It will include people who added a product to cart on your ecommerce store. 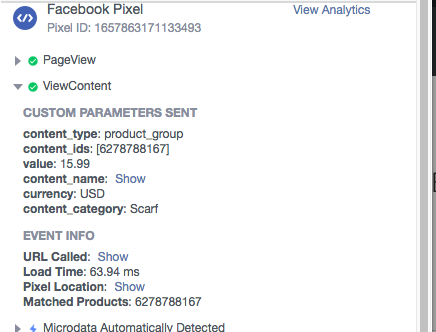 You can choose product value, currency, content_name, content_type, contents, and content_ids for laser targeting. These are the different parameters that you can use. There are several parameters that can be used. 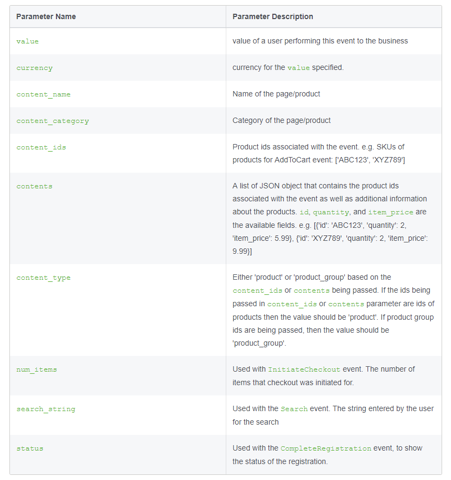 For instance, you can use ATC event and select content_ids to select a specific product. Content_id is a parameter that represents product ids such as SKUs. So if you want to create a custom audience of all the people who added one particular product in their carts, this can be achieved with the help of content_ids. Similarly, you can use content_name to target a page or product, content_type to select a product or a product group, and so on. You can create hundreds of combinations. Be smart. It is another standard event that lets you create an audience based on the content viewed by people on your store such as a product page, a landing page, etc. Here is an example of how ViewContent event can be used to create a custom audience for people who have viewed a specific page. Again, you can use parameters with ViewContent event such as content_name, content_type, and content_ids. This helps you create a better custom audience that leads to better lookalike audience. This event will help you create lookalike audience similar to people who have initiated a checkout in any way on your store. 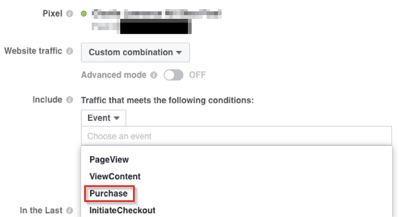 For instance, you can create a custom audience who clicked checkout button and had a specific product added to their carts (using the content_ids parameter). You could use this custom audience to retarget everyone who viewed this product and started the checkout process but didn’t finish it. What’s better than creating a lookalike audience based on people who have added their payment information in the checkout flow on your store? You can use multiple parameters to create a more customized audience. For instance, you can use value parameter to filter people based on the amount of the product. Or, just like above, you can make this audience product specific. You can use Engagement audiences to reach people who have engaged with your page or post. You can choose a page, any post, and engagement level to create a custom audience. Get started by including people who meet one or multiple or all criteria. 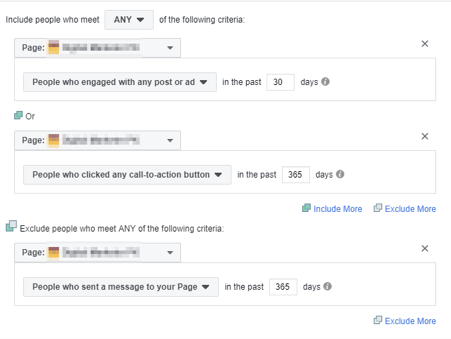 Select Facebook Page from Engagement audiences. 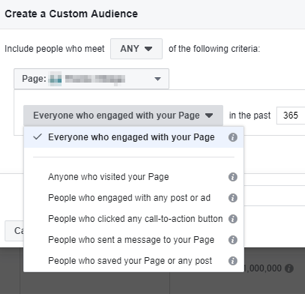 Choose a Facebook page and select the engagement level that matches your goal. 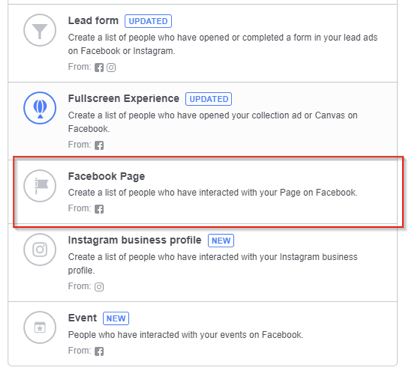 You can choose everyone who engaged with your page, messenger, content, ads, or in any way with your page. Or, you can select people who have engaged with any post or an ad. There are multiple ways to create your audience. You can create multiple rules and exclude specific people. You can exclude people who sent you a message or you can include people who meet one or more criteria. Lookalike audiences are only as good as the sources used to build them. This means that you need to focus on sending quality traffic to your site. The 6 techniques discussed above will help you create custom audiences that you can use as your lookalike audience’s source. A custom audience of customers that have purchased from your ecommerce store, added a product in the cart, or entered checkout flow, etc. is more likely to generate a similar audience that will result in sales. Once you have your lookalike audience, the next big step is creating appropriate ads that will persuade them to visit your store and buy. 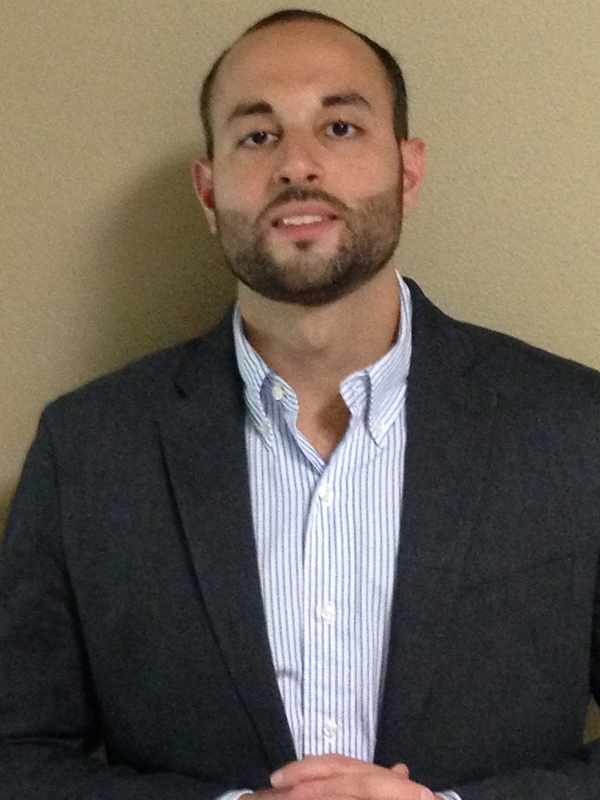 Once you start generating sales and get new customers. Repeat the process by creating new lookalike audiences from new customers. This is one simple strategy that will skyrocket your ecommerce sales.